Keeping those edges or the hairline under control is an issue for many ladies whether natural, relaxed or somewhere in the middle. That particular area of our hair is super delicate, so we need to definitely Handle With Care! Here are three things you can do to help those edges stay put! (2) Take care when installing protective styles. 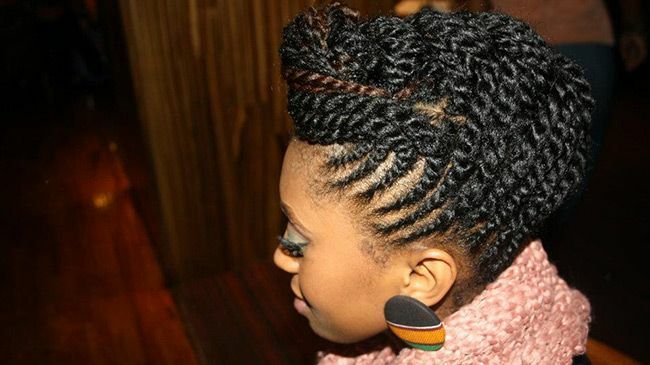 A beautiful, neat set of braids or twists can be achieved without catching every single strand of baby hair. That baby hair don’t wanna be braided! It’s up to YOU to (nicely) communicate to the stylist that you’d still like to have hair on your head once those braids come out. Don’t be shy! Contrary to popular belief, you’re NOT supposed to have a headache when you walk out of that braid shop. Many of us have come to accept that as a normal part of getting braids and such but it’s quite UNacceptable and unnecessary. The hair follicle can only take but so much tension so please be careful and be mindful, too, of how MUCH hair you’re adding as this can weigh the hair down and cause loss. In a related story… if you rock wigs or weaves from time to time, your cornrowed “base” should still allow you to breathe! I elaborate on that in this throwback post. Many regular wig and weave wearers will leave out their hairline and the nape area so as to protect them from potential damage. Oh! Glue on your edges? Not a great idea. Also, how bout just taking a break from your weave or wig every so often? (3) Ponytails, Puffs & Buns… be easy. They’re cute and all but this is a good example of “too much of a good thing…”. I know we love our puffs and buns but try switching it up and alternating your pulled-back hair days with your hair-out or down days so you don’t put too much stress on your edges. Try massaging the area with some Jamaican Black Castor Oil. The act of massaging alone improves blood circulation so just about any oil will do. The thing with JBCO, though, is that it has been known to increase blood flow to the scalp, sending nutrients to hair follicles which, in turn, boosts hair growth. Infusing it with an essential oil that stimulates circulation to encourage growth (rosemary, peppermint…) is even better! Keep your diet balanced. Eat right, take your daily vitamins and drink lots of water. Remember, healthy hair begins on the inside. What steps do YOU take to make sure you don’t end up edge-less? Share your tips and tricks below! This post was written by LuvToBNatural for CurlyNikki. CurlyNikki Says: Shea Butter or pure aloe vera gel or juice are also excellent edge setters. Just slick some on and tie on a scarf. Voila. Magic.